MONDAY, April 10, 2017 (HealthDay News) -- Strokes are typically associated with the elderly, but new research suggests that strokes are increasingly happening to Americans under 65. The study looked at a sample of data from some U.S. stroke hospitalizations. From 2003 to 2004 in this sample, more than 141,000 people from 18 to 65 were admitted to hospitals for stroke. By 2011 to 2012, that number had risen to more than 171,000, researchers found. "Our results stress the importance of prevention of stroke risk factors in younger adults," said lead author Dr. Mary George. She's a senior medical officer with the U.S. Centers for Disease Control and Prevention's division of heart disease and stroke prevention. "Young adults, ages 18 to 54, are experiencing a small but sustained increase in stroke and in the prevalence of traditional stroke risk factors, such as high blood pressure, diabetes, high cholesterol, tobacco use and obesity," George said. Up to 80 percent of strokes are thought to be preventable, she said. George said the study's findings "should prompt a sense of urgency to promote and engage young adults in practicing healthy behaviors, such as exercising, eating a healthy diet that includes plenty of fruits and vegetables, avoiding smoking, and maintaining a healthy weight." The impact of a stroke is significant at any stage of life, she said. But George added, "It is uniquely complex when younger adults in the midst of careers, serving as wage earners and caregivers, may suffer disability that can impact their lives and the lives of family members and loved ones." Stroke is the fifth leading cause of death in the United States. Each year stroke kills more than 130,000 Americans. Stroke is also a leading cause of disability, George said. To study trends in stroke, the researchers used a database of some U.S. hospital stays gleaned from billing records. The 2003-2004 data included more than 362,000 stroke hospitalizations. The 2011-2012 information included nearly 422,000 stroke hospitalizations. There are two types of stroke: ischemic and hemorrhagic. An ischemic stroke, sometimes called a brain attack, is a stroke that occurs when a blood clot blocks the blood supply to the brain. 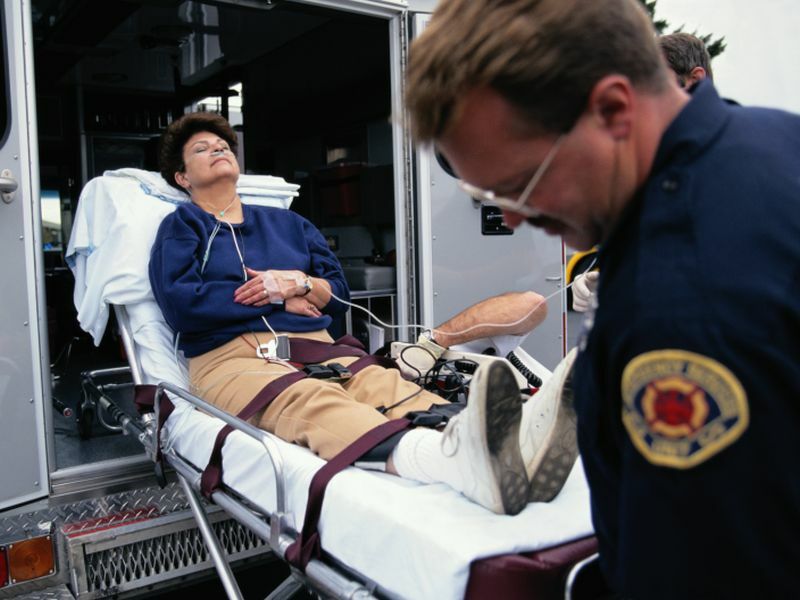 Hemorrhagic strokes are caused by bleeding in the brain from a ruptured blood vessel. Men between 35 and 44 years old saw a striking increase of 41.5 percent in hospitalizations from ischemic stroke over the two study periods. The researchers found that the rate of hemorrhagic strokes remained basically stable during the study period. The one exception was in the 45 to 54 age group. There was a slight decline in hemorrhagic strokes for men and blacks in that age group, the study showed. The researchers think an increase in stroke risk factors, such as high blood pressure, diabetes, high cholesterol, obesity and smoking, are behind the rise in strokes among younger adults. During the study, the percentage of people with three or more stroke risk factors roughly doubled for all age groups. "Preventing and controlling stroke risk factors among young adults can save lives, reduce disability, decrease health care costs and improve the quality of life for tens of thousands of people and their families," George said. The study was published online April 10 in the journal JAMA Neurology. One specialist questioned the use of billing data to uncover trends in stroke and isn't sure a real increase in strokes among younger adults is occurring. "The systems for counting stroke in the United States are extremely limited," said Dr. James Burke, an assistant professor of neurology at the University of Michigan. "Credible alternatives may explain what appears to be an increase in stroke among young men and women, but is not," said Burke, who co-wrote an accompanying journal editorial. "MRIs are more widely used, which can lead to an increase in diagnosis of stroke," he said. "MRIs are being used for all kinds of things, and so when you put lots and lots of people in MRI scanners, for example for headaches, we will find asymptomatic brain injury that is stroke-like, and how much classifying of these as stroke is not clear," Burke said. In addition, the United States doesn't have extensive databases that track patients and medical conditions, he said. "Our ability to make strong conclusions is surprisingly limited since we don't have national health data on everybody. When we are making these measurements, we are looking at a small chunk of the population," Burke said.